Sri Kala Ranga's in-house dance productions are labors of love, not just of the instructor, but also more importantly, of the keen and bright-eyed young student. Debuting in 2006 with "Shree", an ode to Goddess Lakshmi, Sri Kala Ranga's second production was "Pancha Bhoota Sthalam" an offering to Lord Shiva. It was at the Mani Mandapam of the Kapaleeswar temple that the students performed "Shiva Arpanam", an entire maargam marking the fifth annual day celebrations of the school. "Devi Mahatmyam" was a production exclusively involving the senior students of the school performed in Jan of 2014 at Vani Mahal. 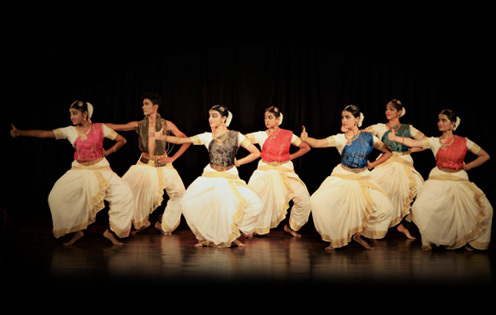 The students also performed at Natyanjali Festival (2014) at Chidambaram. In November, 2014, the students presented Krsna, a thematic production bringing out the different stages of Lord Krishna to mark the 10 year celebrations of the school. Skanda, Kanda, Kumara, Muruga, Subramanya, Karthikeya, Velava....many names, one manifestation; many manifestations, one energy! Energy that is knowledge, intellect, valour, courage, grace and compassion. Energy that can heal the world of all illnesses. Skanda is a prayer and an offering to heal the world. The presentation narrates the birth, childhood pranks, the essence of pranava mantra and the power of shakthivel. It concludes with the Soorasamharam.